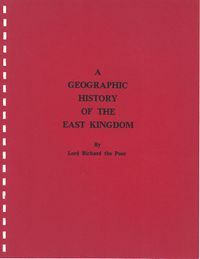 A Geographic History Of The East Kingdom is a book created in 1990 by Lord Richard the Poor, setting forth the growth and evolution of the SCA branches that make up the East Kingdom. Covering two decades, the maps provide a visual reference for the kingdom’s growth from a few isolated groups in New York and Boston to dozens of baronies, cantons, and shires covering the region. Originally hand-drawn and typeset in the days of dot-matrix printers, and written before social media and widespread Internet access made it easy to collect feedback from far away, the book had fallen out of circulation with only a single copy available online. With Lord Richard’s permission, it has recently been re-posted and converted to a more web-accessible form. This page was last edited on 31 May 2017, at 15:02.